The Typhoon is a powerful portable spray tan extractor with an airflow of 900m3/hour. Designed and manufactured in the UK for heavy duty or light spray tanning it complies with Health & Safety requirements (SR13 - COSSH). The Typhoon is supplied with a 1 year warranty, free SPARE washable filter and is easy to operate and maintain. INVEST IN THE BEST ... buy the Typhoon extractor fan today! Your room will be free of overspray even during back-to-back tanning or spray tan parties. No more dirty walls, floors and furniture stains! 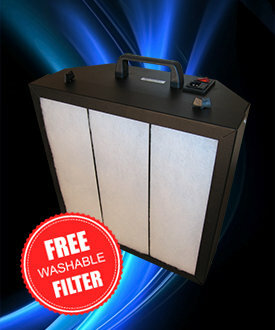 And the WASHABLE FILTER means you don't have to buy regular replacements - saving MONEY! You must comply with Health & Safety Guidelines in the workplace for Business Liability Insurance. The Typhoon has been independently tested and complies with UK Health & Safety regulations (SR13). You can download the LEV report here and use this as proof of performance. Remember Health & Safety Officers can randomly visit your business or premises (contact your local authority for more information).